I'm a massive fan of Aldi - I do all my food shopping there and I pride myself on the both the speed of my packing (I can beat the check out staff!) and always managing to get the weekly shop in for under £100 - pretty good for a family of five (and I really need to get out more I know)! Anyway, £100 for the weekly shop is generally achievable as long as I've managed to avoid what I call 'The Aisle of Temptation' - that's the aisle in the centre of every Aldi store where that weeks special buys are displayed. Special buys comprise of things like sports equipment, gardening equipment or camping equipment and so on, depending on the season. Well this week, I'm afraid, you're going to have no chance of avoiding 'The Aisle of Temptation' because as from today it's UPCYCLING week and Aldi are selling affordable versions of everything you need to upcycle a piece of furniture - from fabric to power tools, they've got it all. 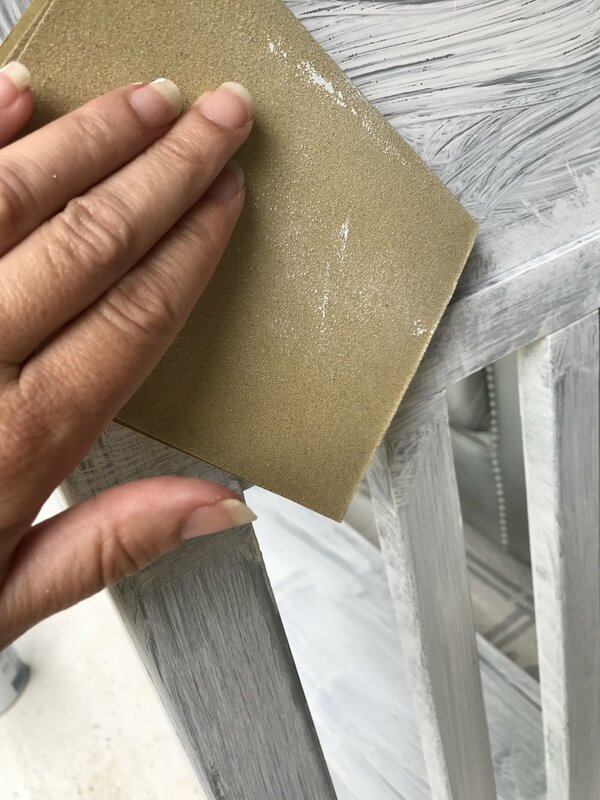 To mark upcycling week, Aldi asked me and three other bloggers to upcycle a piece of furniture using some of their upcyclng range. They also threw in the challenge of then selling the upcycled item and donating the money to the charity Teenage Cancer Trust. As posh coffee at home is becoming such a big thing, I decided to up-cycle a console table and change it into a Home Barista Station! So, I purchased an inexpensive but good quality console table in plain white. 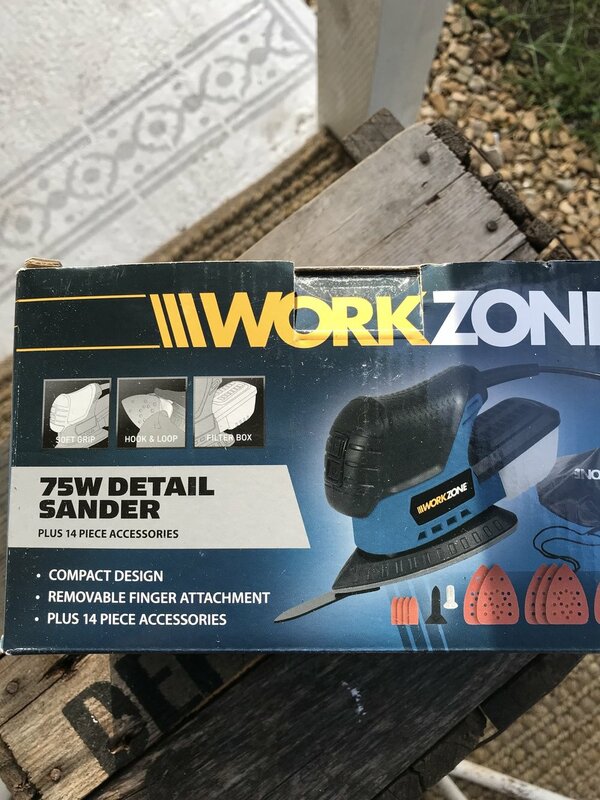 Let me at those power tools! This gives a smooth surface and provides a good 'key' for the paint to adhere too. 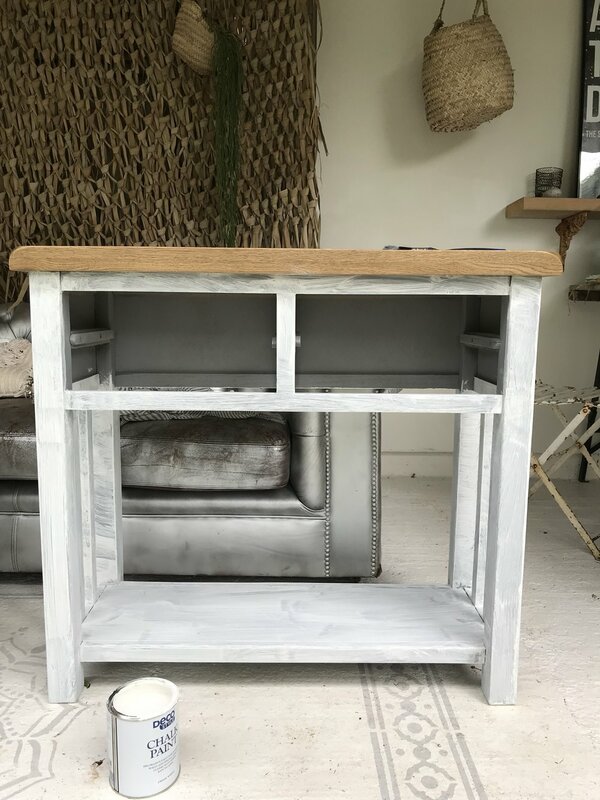 I then painted the console with two coats of Aldi Chalk Paint - White. I then lightly sanded the console again after the second coat of paint using fine grit sandpaper. Since turning 50, Dee was finding she was having to massively up her exfoliation game. I then removed the existing chrome handles with the Aldi 3.6V Pivot Handle Screwdriver and sprayed them copper with Aldi Decostyle Spray Paint. I also bought six chrome cup hooks and sprayed them copper too. Whilst the copper items were all drying, I painted the console table with Aldi Chalk Paint - Dove. Rob had 40 fits when Dee failed to put newspaper down to protect the floor. 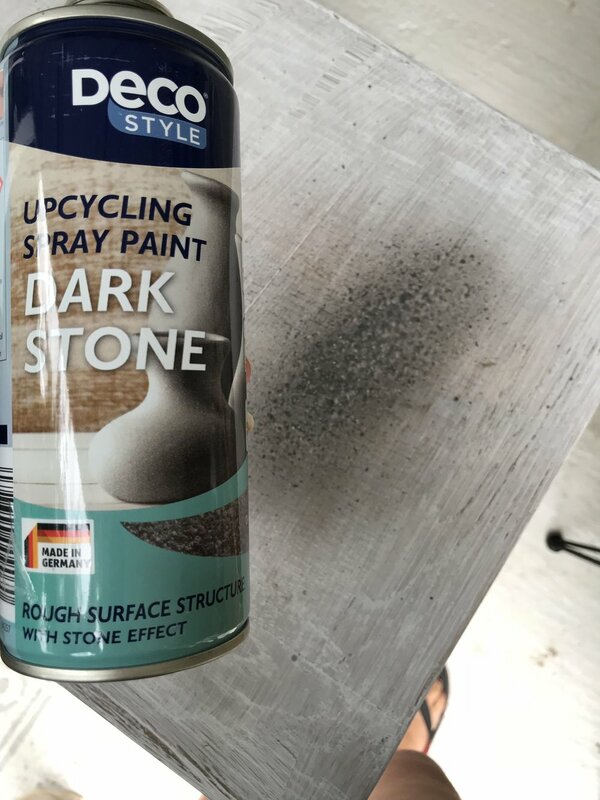 When this was dry, I sprayed the top of the console table with two coats of Aldi Decostyle Stone Effect Spray Paint - Dark Stone. Cardboard floor protection down now. I then gave the whole unit a coat of Aldi Furniture Wax. This hardens to make a much more durable finish. Once this was dry, I re-attached the drawer handles using the Aldi 3.6V Pivot Handle Screwdriver. I also attached the 6 cup hooks. To finish the Home Barista Station, I up-cycled some old pots and jam jars to use as straw and sugar holders, with a variety of Aldi paints and sprays. And here's the finished item! A Home Barista Station! Well, a useful cupboard to all of your coffee paraphernalia together at least. And new faffing opportunities as well! I're really enjoyed up-cycling this piece and trying out all of the Aldi kit. I was particularly impressed with the power tools - really good kit for the price and they come with lots of accessories too! I didn't get to use the staple gun, the fat quarters or the stencilling kit but I'm sure I'll find a use for them soon! This blog post was sponsored by Aldi UK, but, as always, all opinions are my own.